Grasim Industries recently demerged Aditya Birla Capital Ltd by way of allotment of shares to existing shareholders. In April 2016, Aditya Birla Nuovo got approval for merger of itself into Grasim Industries. Post the merger, they spun off the financial services business, including the mutual fund, NBFC, life insurance and payments bank under Aditya Birla Capital. We wrote about this deal in our premium newsletter: The ABNuvo-Grasim Merger throws up an interesting business. In June of this year, Premji Invest, the family investment arm of Wipro chairman and billionaire Azim Premji had invested 700 Crores to acquire a 2.2 percent stake in the company. This deal valued Aditya Birla Capital at Rs32,000 Crores. The de-merger was completed in July 2017 and on 1st September Aditya Birla Financial Services got listed on the Exchanges. Every shareholder who held 5 shares of Grasim on the Record date received 7 shares of Aditya Birla Capital. But if you had bought the Grasim shares before the demerger, how do you split your purchase price between the Grasim shares and the AB Capital shares you now have? We’ve written a detailed and FREE article on the subject: How to calculate your purchase price in case of a demerger? 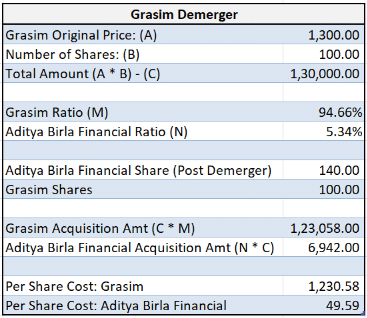 Today, Grasim has released the calculation for cost of acquisition of Aditya Birla Financial Services for shareholders who held the stock on the record date. Assuming you had bought 100 shares of Grasim at 1300, how should you treat the acquisition price of Grasim and that of Aditya Birla Financial Services? Given is the Calculation based on Assumption that you have acquired Grasim stock at 1,300.00. If your price is different, use the Excel Sheet (Link) to get the exact calculation. Disclosure: We held the Grasim shares and then exited Grasim and AB Capital at prices of about Rs. 1192 and Rs. 204 respectively. (This was noted in the post as well) The valuation of 45,000 cr. for AB Capital seemed a little rich, and we just decided to book the 15% return in two months. However, please do note that this is not a recommendation, and the demerger price is for your information. We expect that in the next tax season a lot of people will want to know, so they can calculate the tax impact.